The cable news shakeups began with Megyn Kelly, who reportedly turned down many millions to extend her contract with Fox News to accept a deal with NBC worth $TK. 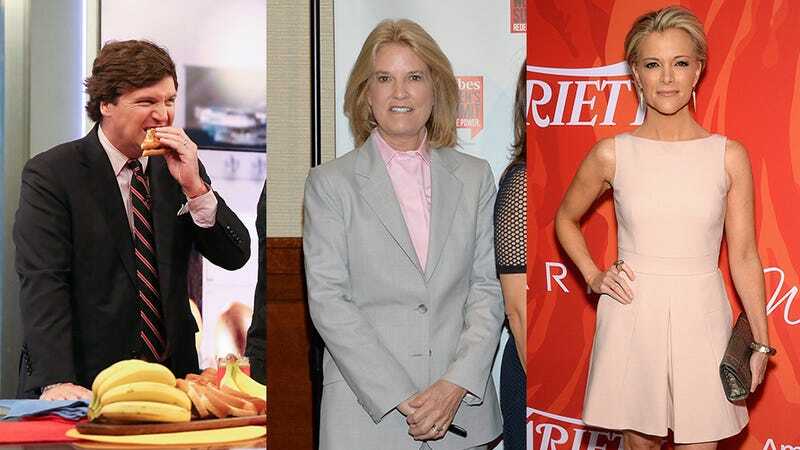 Tucker Carlson, the former bowtie-wearer bottled by the same vintner as Sean Hannity but given less time to age, was then given her slot in the network’s “powerful prime-time lineup.” And now it’s being reported that the aftershocks are continuing, as Greta Van Susteren, former host of Fox News’s On the Record, is moving to MSNBC to host a show called—find something to grab onto—For the Record. The program will debut on Monday, January 9, based in Washington, D.C. Van Susteren replaces Bloomberg’s political television show With All Due Respect, which ended in early December. This is big news for the people involved, as Susteren, Kelly, and Carlson’s moves will no doubt result in bigger paychecks, but for us (or those of us who watch cable news), the job changes will result in nothing but minor shifts in our remote control habits. Despite the changes to their business cards—barely noticeable adjustments in cardstock weight and color palettes—they’re still just three gigantic, shrieking faces on our TV screens, able to be watched or avoided with relative ease.